Join our Tea, Talk and Stories groups to meet new people, have a good chat and share great stories. Drop in, sit down and enjoy listening to a great story or poem; chat about the story or poem or simply enjoy a cup of tea! Our shared reading groups are different from the usual reading groups. You don’t have to read anything in advance. Our Reader Leaders will read a poem or story to you to start a conversation. Perhaps it stirs a memory or you have had a similar life experience? The groups are friendly and social, an opportunity to meet and chat inspired by some great writing. If you want to know more, just ask at your local library. The Tea, Talk and Stories groups have been developed with support from The Reader who are working nationally to develop Shared Reading to support health and wellbeing. 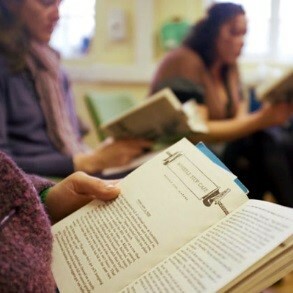 For more information about Shared Reading and their work go to www.thereader.org.uk.